Ever since the Boston Tea Party, when colonists threw tea overboard and vowed against drinking tea, coffee has been an American favorite. Coffeehouses were the preferred meeting place of the Continental Congress. The Declaration of Independence was first read aloud to the public in a coffeehouse. Today, coffeehouses continue to be venues for change -- where Christians fellowship and the un-churched come to know more about our Savior in a non-threatening environment. My first exposure to a coffeehouse-like ministry was a visit to “The Fire Escape” in Virginia Beach, VA, during my high school years. This ministry was set to look like a club in a touristy area, but had Christian bands performing and was staffed with sensitive Christian workers. The venue looked like an old fire engine house and had a “no ID required” sign. Pretty creative. Years later, while burning through some frequent flyer miles and visiting some missionaries from my church, I bumped into an interesting operation near the Jaffa Gate in Jerusalem. I’ll never forget enjoying a latte while listening to St. Louis’ own Kent Henry piped through the sound system! 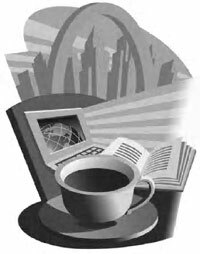 As a relatively recent phenomenon, Saint Louis has become home to quite a number of Christian coffeehouses. Unfortunately, much of the church-at-large knows little about Christian coffeehouses; the many different types of coffeehouses making it even more confusing. Trying to categorize the different types of coffeehouses is a feat unto itself, considering the widely varying types. From a broader perspective, there are numerous different types, such as coffeehouses that run full-time as ministries. Currently, I don’t think there are any coffeehouses in St. Louis that quite fit that category. Some coffeehouses, not even owned by Christians, are still very open to allowing Christian musicians to perform. I won’t list examples here, but if you visit some of the local Christian band’s/musician’s/artist’s web sites, you may be able to figure these out for yourself. And then there are all kinds of variations and mixtures of the above. No wonder many are confused! Coffeehouses are a great place to enjoy music, relax, unwind, socialize, and schmooze. For Christians, they are a great place to meet up with friends and family to enjoy music, food, and drinks. Many coffeehouses provide board games, magazines, and Christian books, making them a great place to just hang out. Coffeehouses also provide an opportunity to connect with other like-minded Christians. My wife and I joke about how we met some people who became very good friends at a coffeehouse and then discovered later that we went to the same church! Often, a Christian community develops that goes beyond denominational and racial barriers. Coffeehouses can also provide a non-threatening introduction for non-Christian friends. I have personally been able to see people come to Christ in a coffeehouse setting who arrived as an unbeliever and left as a new creation. Even though we call them “coffeehouses”, perhaps they should be called “music houses,” because music often takes a much higher priority than the food and drinks served. The music you will hear in a coffeehouse can vary greatly -- You may find Christian contemporary, alternative, folk, rap, blues, classic rock, gospel, country, bluegrass, Celtic, a cappella, and sometimes even harder rock, punk and heavy metal. In addition to that, you may also find poetry or drama as part of the mix. Many of these venues also display paintings as an extension of their sensitivity toward the arts. It has been my experience that many of our local St. Louis-area musicians have great hearts and love to minister in any way they can. This is in direct contrast to some national “Christian” bands that often are composed of young people touring, without the accountability and support of a local church and pastor, while facing excessive flattery and other temptations on the road. The overwhelming majority of our St. Louis local musicians seem to be grounded and “real”, displaying a great heart for the lost and needy. Music performed at a coffeehouse is not the same as at a typical concert. At a concert, musicians tend to have the undivided attention of the audience. A coffeehouse is a place where oftentimes the musicians are playing background music, while other private conversations may be taking place. I know of one major Christian musician who took great offense at his first coffeehouse performance; he became so upset that people were having side conversations while he was playing, that he stopped every one from talking and demanded their undivided attention! Generally, music performed at a coffeehouse is not the same as what you experience in church. A worship leader’s job is to get the congregation “vertical”: to worship God. But coffeehouse musicians are much more “horizontal”: they tend to be more relational and communicate directly with the audience – that is when the audience is paying attention! However, I have seen many successfully move into a more worshipful mode after having connected with their audience, especially if the audience is overwhelmingly Christian. As many Christian coffeehouses are generally on the small side, often the music is best when it is kept acoustic. Many drummers use a djembe instead of a full drum set in these settings and considerate bands will make sure that conversations can still take place while the music is playing. Coffeehouse ministries are usually quite different from a normal evangelical outreach, tending to be low key and more friendship-based. At the New Earth Coffeehouse in Kansas City, MO -- a very large coffeehouse where two or three bands would play each Saturday night to crowds of 200-500 -- the pastor would give a seven minute talk during intermission, and at that time, ask for the undivided attention of the audience. He would typically cover a spiritual topic with enough content to whet people’s appetite, without blowing them away with in-your-face evangelism. After his talk, interested people would often engage him in conversations after the following band started playing. Many of these people would go on to receive Jesus. Once I questioned him about the effectiveness of his ministry, and he pointed out that although fewer people came forward than a typical altar call scenario, over the long term, he saw just as many people stick with their decisions. This same pastor also made it a point to explain to me the balance needed in coffeehouse ministry. If you’re too forceful, the unsaved may walk in and think, Hey -- this is just like church, or this is way too religious, and leave. However, if there is no spiritual content, volunteer workers will sense the purposelessness and will eventually quit. And many ministry-oriented coffeehouses are highly dependent on volunteer help. Many coffeehouses have people that are specially trained in ministry and evangelism to support people who are ready to receive Christ or have special needs. Sensitive Christian workers are a great asset to any coffeehouse. Christian coffeehouses provide a great alternative to the vulgarities of modern culture. As we watch most of our movies, theater, and music become corrupted, Christian coffeehouses provide an entertainment oasis. For example, before I see a movie, I like to check out its content at www.screenit.com. But unfortunately, what I usually find, even in highly regarded movies, is an excess of taking the Lord’s name in vain, profanity, or sexual content. It’s kind of like reading the nutrition label on fast food – it looked so good until you saw what it’s made of! Decent Christian coffeehouses do not tolerate profanities and are always non-smoking. St. Louisans have a real option to enjoy great music and fellowship without polluting their minds and supporting the carnal Hollywood crowd. And remember to support the coffeehouses and musicians you run into! It takes a lot of hard work, dedication and money to run these establishments – not to mention the musicians and other artists that perform there; so support them: not only might you want to consider volunteering for one of these ministries, but bring your friends, purchase some food, buy a CD, and leave a tip!